The anticipation causes you to squirm, fingers in your ears, mouth open, eye squinting, the gun master to yells “fire” and… BABOOM! The extremely loud noise from the civil war era canon makes you jump, laugh, giggle and look around at everyone else enjoying the gut wrenching blast. That’s the fun part. The scary part is learning just what damage these massive guns did to human lives in our greatest national conflict, the War between the States. A reenactment group camped at Charter Day School to teach students what life was really like during the 1860’s. The group, who represent actual Union and Confederate troops who fought in the Cape Fear area, marched through campus for the morning flag raising. They also recreated authentic war camps for infantry, cavalry and artillery regiments. The enactors are genuine to the time period with tents, supplies, clothes, weapons and a huge artillery canon that could fire a 6 pound steel ball over a mile (although blanks were used for demonstration). Students learning about the War between the States in the classroom were able to hear heart-felt stories of what a soldier’s life was like, or ask officers questions about war strategies and tragedies, and walk back in time into a tent and touch the few personal items that soldiers were able to keep with them. “This is why we do these reenactments, it’s to keep these stories and memories alive,” said Deputy Del Routh, event organizer and Student Resource Officer for Charter Day School, “but we really enjoy teaching students because everything is new to them. These kids will get to see and experience things about the War between the States that other children may never have the chance to experience their whole lives.”The children moved throughout the day from camp to camp to learn about different perspectives of those who fought and died. The regiments represented were Union troops, 88th New York Infantry Irish Brigade, and Confederate troops, Company K, 20th North Carolina Infantry, 4th North Carolina Calvary and the 13th North Carolina Light Artillery (Adams Battery).“This experience, I’m sure, has left an indelible mark on many of these students minds,“ said Superintendent Mark Cramer, “these guys did a great job of bringing that period in history to life.”The event was held in the woods next to campus. On Sunday, the enactors set up their tents and gun emplacements, cooked dinners over camp fires and spent the night in their tents. Monday was spent hosting the classes through the encampments and teaching about the equipment. 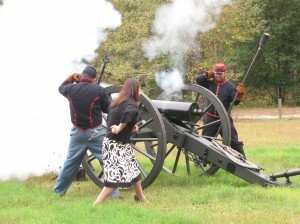 Firing the huge cannon was the highlight for each class at the 900-student school. The event was attended by Sherriff John Ingram as well as other Deputies and North Carolina State Troopers. Special thanks to the enactors: Mike Munford, Del Routh, Jacob O’Brien, Bryan Stanton, Hunter Stanton, Ben Dolby, Jim McKee, Randy Hines, Derrick Smith and Daryl Hayes.